I’ve been a fan of Mark Bittman’s cooking and eating advice since I first saw his quirky, easy-to-follow “Minimalist” recipe videos. 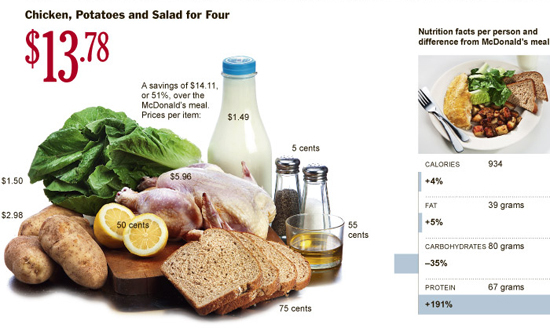 But he really knocked it out of the park with his latest column in the Sunday Times where he argues decisively, with nifty infographics, that good, healthy food can in fact be cheaper than the fast food alternative. I’ve been a fan of Mark Bittman’s cooking and eating advice since I first saw his quirky, easy-to-follow “Minimalist” recipe videos for the New York Times.